RCR's Dr. Eric Warren gives Chris Filo and Daniel Gray a tour of the #3 America Ethanol hauler. It was a sticky yet bright summer morning at Pocono Raceway in late July. The “Tricky Triangle” is tucked in the mountains of northeast Pennsylvania, about an hour from the closest airline hub. One of the most impressive solar fields in the United States sits adjacent to the superspeedway. This project provides electricity to the track and more than 300 area houses, making Pocono Raceway one of sport’s greenest venues. It also makes it a major league stage to showcase our American-made biofuel and its benefits to two influencers, which was my mission that day. The American Ethanol team has focused on embracing engine experts and consumer influencers. My job was to get our two guests in front of the engine and fuel experts in NASCAR® and make them advocates of biofuels. Our plan was to teach the teachers. We met with Daniel Gray, an influential and well-known auto blogger, and Chris Filo, better known as Chris Fix from YouTube. This wasn’t Daniel’s first NASCAR® race, and his blogs have always been friendly to us. Hailing from New Jersey, Chris was excited for his first NASCAR® race. Chris has over two and a half million subscribers to his YouTube channel that instructs people how to make repairs and service their own vehicles. He attested to be agnostic about biofuels. We were going to change that. The first stop was the American Ethanol #3 team hauler, the semi-trailer that hauls the cars and equipment to the track. 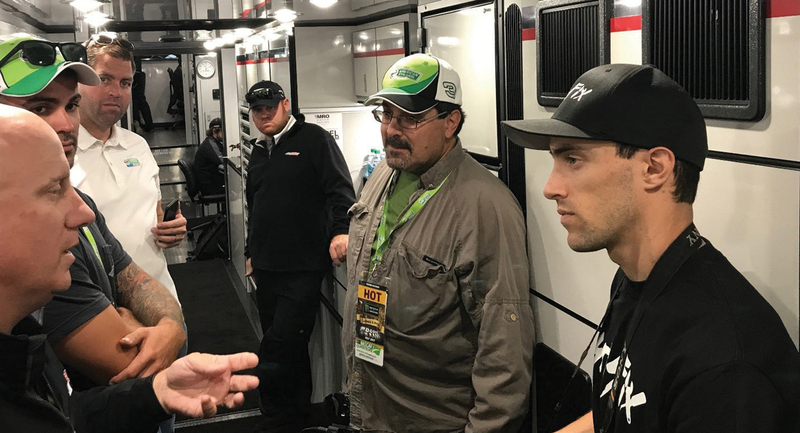 There we would meet with our longtime advocate and team owner Richard Childress, our driver Austin Dillon and Richard Childress Racing’s (RCR) Chief Technology Officer Dr. Eric Warren. We arrived at the #3 hauler with a warm welcome from Richard and Austin. We talked about how the car and the team looked this weekend and the season so far. When we got into the hauler, Dr. Warren explained each area’s purpose. It’s an extraordinary combination of auto parts store, garage and command center on wheels. The tour’s culmination came at the front of the hauler. Three walls of computer monitors showed the data gathered from every aspect of the race: the car, the engine, the driver, the track and pit stops. “Right now, we are looking at 12-13 seconds for four tires and fuel,” Dr. Warren said, answering Daniel’s question on how long it takes to pit. The pit stop of today has evolved into a well-choreographed event. How did they get from over 60 seconds to 12 seconds for a full pit stop? I was so curious that I decided my secondary goal that day was to find out how. “Well, around 1970 they started gluing lug nuts on the wheels. You wouldn’t have to hold on to them or put them in your mouth or pocket. That saved a lot of time. Then the innovation in the 1980s was huge with jack, tools and air gun technology. Heck, now the pit crews got cameras on their helmets and they study every move to find efficiencies! And that, my friend, is innovation,” Drew said. 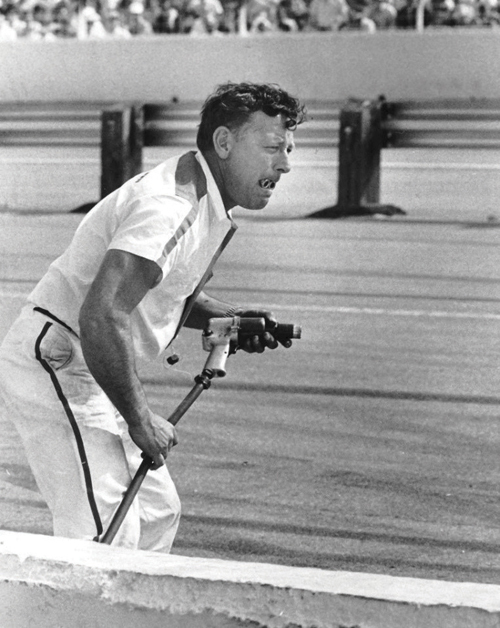 Herb Nab waits to change tires with lug nuts in mouth circa 1960s. I achieved my two goals for that day. Daniel and Chris saw the benefits of using a clean, green renewable biofuel made in America. They also talked with experts who were skeptics-turned-advocates, and they joined the team. Drew also taught me about success: It can only come through innovation.